The notch fits into the midline of the lower central incisors. A patient’s range of motion measurements should be recorded as part of every new patient exam. This adds anywhere from 20 seconds to a new patient exam if you only record the three opening movements, which are “comfort, active, and passive.” If you measure right and left lateral and protrusive movements, you might be adding 60 seconds to your exam time. Yes, it’s that quick. Opening: 40 to 60 mm. If a patient opens to 55 mm with either the comfort or active opening, there is no need to obtain the Passive opening. 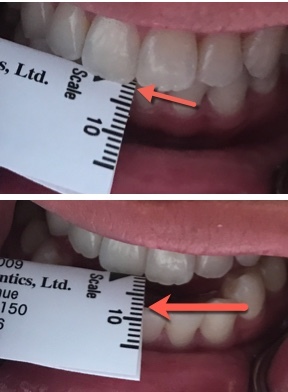 Additionally, do not have a patient open past 60 mm and do not push a patient open past 60 mm. If they can open to 60 mm or you can push them to 60 mm, then they have an excellent opening range of motion. Active: ask the patient to open as wide as they can even if it hurts. Passive: with the patient in the Active opening, the doctor then pushes the patient open using their thumb on the maxillary centrals and the index or middle finger on the mandibular centrals. 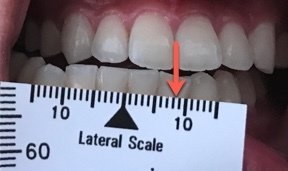 With the arrow of the range of motion scale centered on the maxillary centrals, have the patient move to the left by tapping the mandible on the left, which causes the patient to move to the side that you are tapping. Measure the distance traveled. Repeat this for the right side by tapping the right side of the jaw. Fold the range of motion scale in half at the black triangle on the lateral scale. 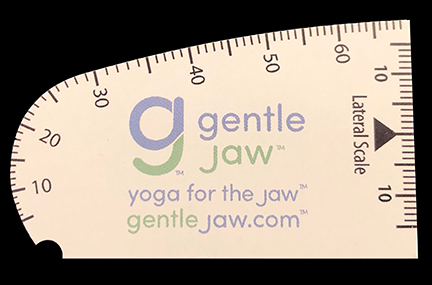 Measure the overjet, then ask the patient to move their jaw forward “like a bulldog” and measure that number. Record those two numbers as separate numbers such as “2+8” so that you know the overjet plus how far they can protrude forward from their centric occlusion. Note in your chart if any of the movements cause pain and if any of the movements replicate their jaw pain. If a movement does cause pain, have the patient point with one finger where the pain occurs. If the patient ever has a future problem with opening and/or moving their jaw, you now have a baseline of what their normal movements are. Do you think it is worth spending up to one additional minute of your time to record these measurements? You will if you ever have a patient who has a problem especially if they think you created it with an injection or by keeping them open too long. As always, I’m happy to help any patient who is experiencing jaw pain or any facial pain including migraines, trigeminal neuralgia, sleep apnea or snoring issues at my office in Beverly Hills. Please let me know how I can help or if you have any questions. i would like to order your measuring device. how do I do this. TMJ or Simply Muscle Pain? © Rich Hirschinger, DDS, Inc. All Rights Reserved.